After almost 40 years, Fender recently dropped the 15o SL strings from their product range. For me bad news because the 150 SL (pure nickel, 008, 011, 014, 022, 030, 038) are the strings of choice on most of my Stratocasters. 08-strings had their popularity peak surely some decades ago. They were favoured especially among country players since thin strings made all those fancy banjo-style rolls and licks easier and faster. When players like Stevie Ray Vaughn promoted heavy strings, 08 became rare and were often no longer on stock in most smaller shops. I started to experiment with strings thinner than 09 amost 20 years ago. Two things I especially liked about them were the thinner g- string because with vintage-style Strat pick-ups (staggered pole pieces) an 016 always seemed too loud for me compared to the 011 b-string, and I like the sound of the thinner wound strings, especially the d and a strings. It was however just a few years ago that I got a hint that Mark Knopfler might have played 08s on the early Dire Straits stuff. By the way, Fender also dropped the 010-038 set some time ago (010, 013, 05, 026, 032, 038) which I personally liked better than 010-013-017… . At least I don’t have to worry about not getting 08 nickel wound strings anymore because Fender still have them with that bullet end at a slightly higher price (3150 SL). I also noticed that they still have the 09, 011,015, 024, 032, 040 set (originally known as 150 extra lights, the strings Mark played on the Making Movies tour) which are now denoted as 150XL, while 150L is now 09,011,016,024,032,042. Knopfler himself has meanwhile moved to heavier string as we know, and plays 010s (or heavier) on most of his electric guitars now. 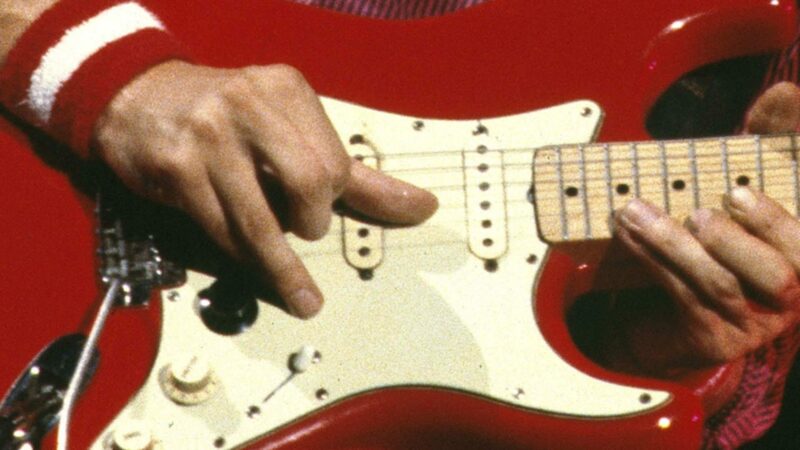 At least on Sultans of Swing and Romeo & Juliet he still played a signature MK Strat with 09s, but even on these songs he tried out 010s on the last tour. It’s strange to know that strings on MM tour were heavier (even a bit) than on early stuff, because I’ve always found his sound on 80-81 boots thinner than in 78-79. I don’t know if it’s due to the difference between Schecter/Fender PU or different amps he used, but to me, his sound in 78-79 has more presence, is warmer, is more “round” than in 80-81 where I find it with less character, thinner. Well I ccan’t find the right words , but I hope you guess what I mean. BTW, with the “new version” of your site, I’m not able to “edit” acomment before publish it. We don’t really know about the string gauge from 77 – 79 , the Super Lights is just the earliest info I found (from middle 80). Are those stringa Mark played back then handmade? I saw some dean markley vintage reissue that said to be handwound. These were Fender’s standard strings, nothing special. I know that some manufacturers (like e.g. wyres strings) describe their strings as handwound but I cannot really imagine someone handwinding a guitar string. Maybe it is like pick-ups where hand wound means that a worker leads the wire from the winding machine by hand. Anyway, the Fender strings in the 70ies were surely not.